Dry cleaning can be very tough on your clothes. One of the most common mistakes is that people tend to dry clean their clothes too frequently and therefore accelerate the breakdown of the fabric. 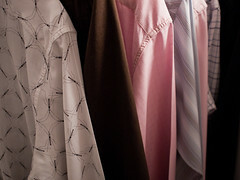 Most times it is not necessary to dry clean after every wear, except when it comes to dress shirts, unless they have been worn for very little time, it is best to get them cleaned and pressed after every wear. One of the worst things you can do is wear an article of clothing and immediately take it off and place it in the closet, there is simply not enough ventilation in the closet to air out the clothing and therefore the odors will remain in the clothing. If you have worn a piece of clothing, take it off, and let it air out, and then inspect if for stains before determining if it must be dry cleaned. Also look in to get a home steamer, as most clothing just needs to be pressed, and a home steamer would be more cost effective. For more tips on dry cleaning, contact Mark Pressed4Time today.